Performance road bike rentals include the Specialized Roubaix Carbon Fiber road bike. Just behind the 10,000 foot climb on the ride up Haleakala, one of the most popular road bike rides on Maui is the West Maui Loop! With the exception of short sections of riding in central Maui and through Lahaina, the entire bike ride hugs the shoreline around the western section of Maui. Unless you are up for riding a bike to Hana, the West Maui Loop is without a doubt one of the most scenic bike rides on Maui. If you like riding performance road bikes and are looking for a different way to see more of Maui, the West Maui Loop is a great ride for you! Stunning scenery awaits at every turn as you ride this mostly two lane paved road going round West Maui. This often overlooked route along the Northwest coasts of Maui is typically not heavily traveled by visitors. Sort of like riding to Hana without the rain forest. And with Mr. Steepy, even the most seasoned bike rider will find challenges along the way. 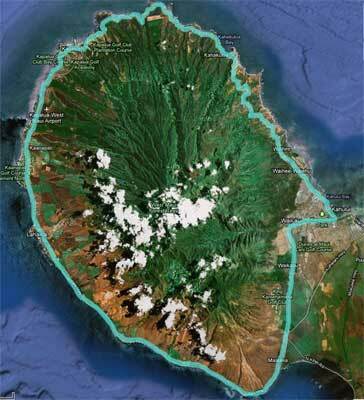 What is the distance of the West Maui Loop bike route? Depending on where you start and where you end, the West Maui Loop bike ride is approximately 65 miles (104 km) if you ride the entire loop. If you don’t care about completing the whole loop and want to miss the traffic from Wailuku to West Maui, start the bike ride in Lahaina and arrange for a ride in central Maui. Doing so could cut the ride distance in half. What is the Elevation Gain on the West Maui Loop bike ride? Almost 5 Thousand feet elevation gain at Mr. Steepy. Should I ride counterclockwise or clockwise? Both directions have advantages and are fun Maui bike rides. If you ride clockwise early in the morning and begin the ride in Lahaina, you’ll likely experience the least amount of headwinds on the West Maui Loop ride and finish before early afternoon. Riding clockwise also provides the most downhill bike riding, although the uphill sections of Mr. Steepy are also steepest on the clockwise ride. Riding counterclockwise puts you in the ocean side lane of the road. When is the best time of day to ride the West Maui Loop? With trade winds common in the afternoons on Maui, you’ll want to ride in the morning or at least get past the northern parts early. If are riding clockwise around West Maui, we recommend beginning your ride early in the morning and finishing early afternoon when the sun will be warmer and trades may begin to pick up. If riding counter clockwise on the ocean side of the road around West Maui, the trades will be at your back on the Northernmost part of the loop but you'll probably finish the ride going into wind. If finishing in Kahului or other central parts of Maui, expect strong head winds later in the day. Maui bicycle ride map for the West Maui Loop bike route. West Maui Cycles bike shop in Lahaina features performance road bike rentals in all sizes including the Specialized Roubaix Compact SRAM Rival Carbon Fiber bicycles. Take a look at the specs on the Specialized Roubaix road bike rentals. Or, give the bike shop a call at (808)661-9005 if you have questions about renting a bike on Maui. All bicycle rentals from West Maui Cycles include a helmet and lock. Our full suspension mountain bike rentals and performance road bike rentals include a tire repair pack and pump. Pedal changes available for performance road bikes and full suspension mountain bike rentals.